New research shows that treating stage II and III non-small cell lung cancer (NSCLC) N+ resected patients with customized chemotherapy (CT) treatment based on their specific BRCA1 expression levels, as opposed to providing the standard treatment, did not increase overall survival rates among those patients who received individualized CT treatment. However, BRCA1 expression levels could be prognostic and treatment could achieve different outcomes. 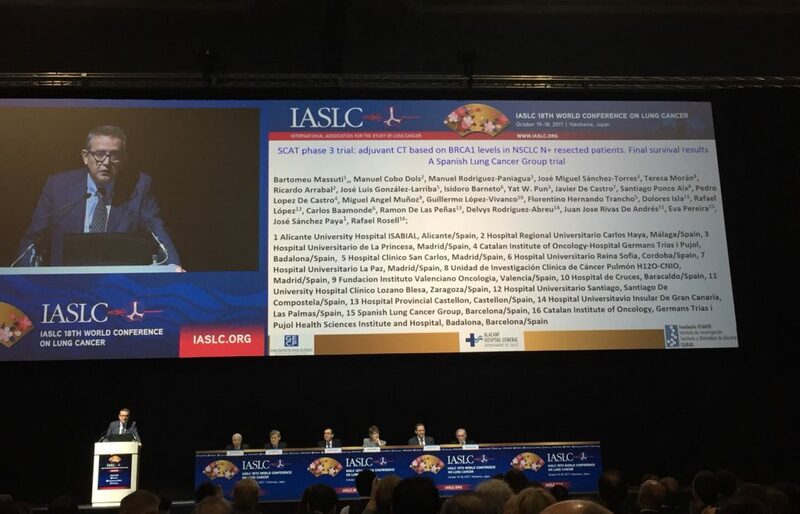 Dr. Bartomeu Massuti of Alicante University Hospital in Spain on behalf the Spanish Lung Cancer Cooperative Group (GECP-SCLG) presented his findings today at the International Association for the Study of Lung Cancer (IASLC) 18th World Conference on Lung Cancer (WCLC) in Yokohama, Japan. For patients with resected NSCLC with lymph node involvement, postoperative platinum-based CT is the standard of care. BRCA1 is a DNA repair factor that is mainly involved in the repair of double strand DNA breaks and may also act as a differential regulator of response to cisplatin (Cis) and antimicrotubule agents. BRCA1 efficiency enhances resistance to Cis, and loss of BRCA1 function is associated with sensitivity to DNA-damaging CT. Therefore, the research team sought to determine if differential CT treatment based on knowledge of patients’ BRCA1 levels could lead to higher survival rates and if cisplatin could be avoided in a pre-defined subgroup. The researchers hypothesized that the five year survival rate of the standard care control group (45%) could increase by 20% in an intervention group that received CT compatible with either their low, medium or high BRCA1 expression levels. While those in the control group received the standard Cis-Docetaxel, those in the experimental group either received Cis-Gemcitabine (low BRCA1), Cis-Doc (intermediate BRCA1) or Docetaxel (high BRCA 1). After median follow-up of 53 months, the OS among the control group was 69.3 months and among the experimental group 82.3 months, ranging from 74 months (low BRCA) to 80.5 months (intermediate BRCA) and 80.2 months (high BRCA). Their findings suggest that survival rates do not increase among patients who receive chemotherapy (CT) treatment based on their BRAC1 levels. However, the researchers did find higher rates of survival than expected in patients with lymph node involvement, and also determined that in the case of high levels of BRCA1, CT treatment with Docetaxel (but without cisplatin) is not detrimental. Also for patients with low BRCA1 levels, Cisplatin-Gemcitabine could be superior to Cisplatin-Docetaxel. The International Association for the Study of Lung Cancer (IASLC) is the only global organization dedicated to the study of lung cancer and other thoracic malignancies. Founded in 1974, the association’s membership includes more than 6,500 lung cancer specialists across all disciplines in over 100 countries, forming a global network working together to conquer lung and thoracic cancers worldwide. The association also publishes the Journal of Thoracic Oncology, the primary educational and informational publication for topics relevant to the prevention, detection, diagnosis and treatment of all thoracic malignancies. Visit www.iaslc.org for more information. The Spanish Lung Cancer Group (Grupo Español de Cáncer de Pulmón ) (GECP/SLCG) is an independent, non-profit making group that, since its foundation in 1991, has focused all its efforts in promoting and fostering the research in lung cancer. The GECP consists of a more than 400 specialists associated with lung cancer (oncologists, thoracic surgeons, radiotherapists, basic researchers, etc.) from all over Spain. It is a network of more than 150 hospitals spread throughout Spanish territory that conduct their research in a coordinated manner. The Group has become one of the main research groups in Europe, with a multitude of studies conducted, more than 110 publications of international relevance, and more than 16.000 patients included in its investigations.